A Boarded Aumbry or Hutch, inspired by an original early 16th century piece from the Victoria and Albert Museum, London. This example, handmade from reclaimed ancient oak, has two doors instead of just one, both carved in pierced gothic tracery, which actually conceals a wide screen television and video equipment. The hand-forged hinges, straps and bolt have been made from genuine wrought iron. 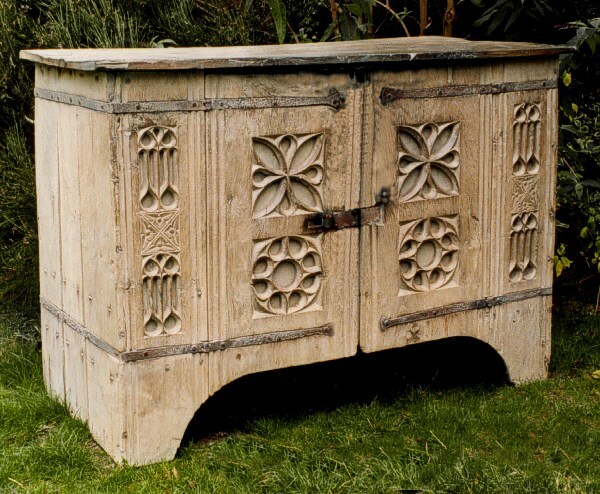 Original boarded furniture from the Middle Ages can command prices well in excess of £30,000.